The next major community amenity under construction is a church built in modern style. 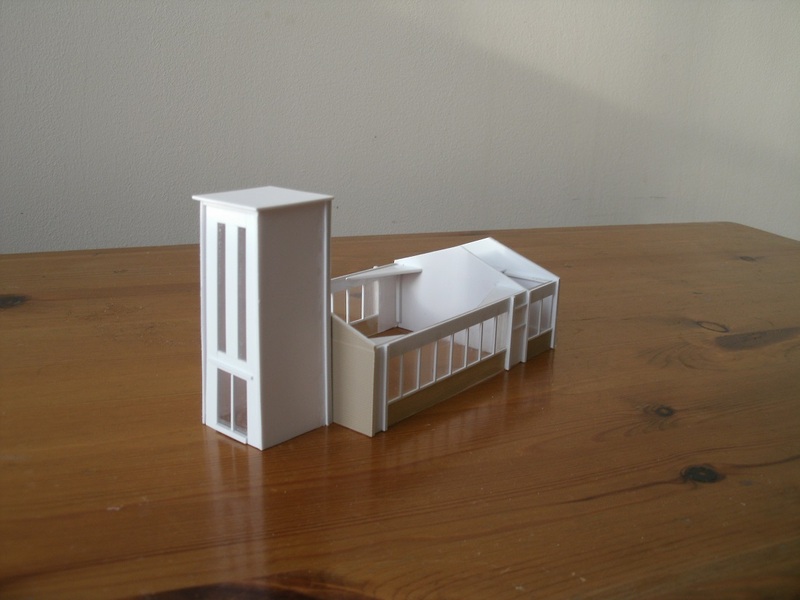 The bell tower is scratchbuilt around a toothpick container, rest using 1mm clear plastic sheet with details overlaid plus other styrene sections. This week I returned to infrastructure work. 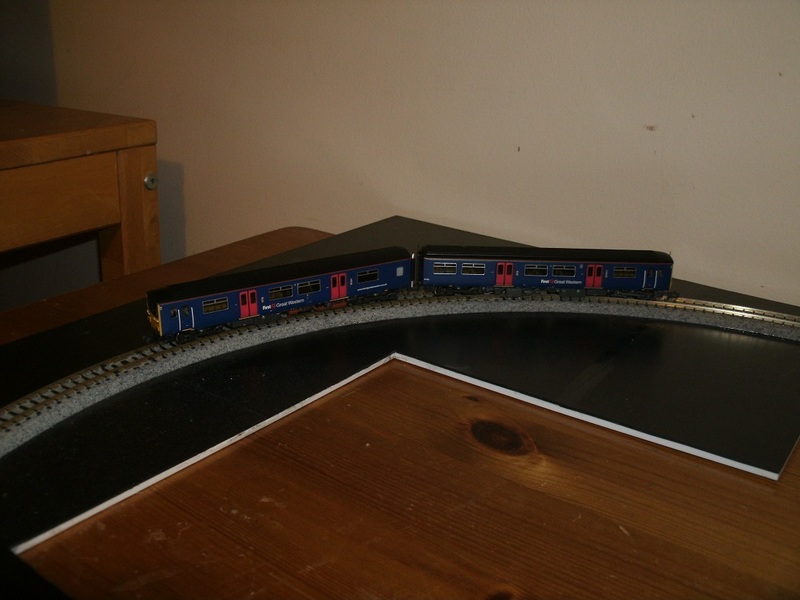 I had a quantity of underused Kato concrete-sleeper track. 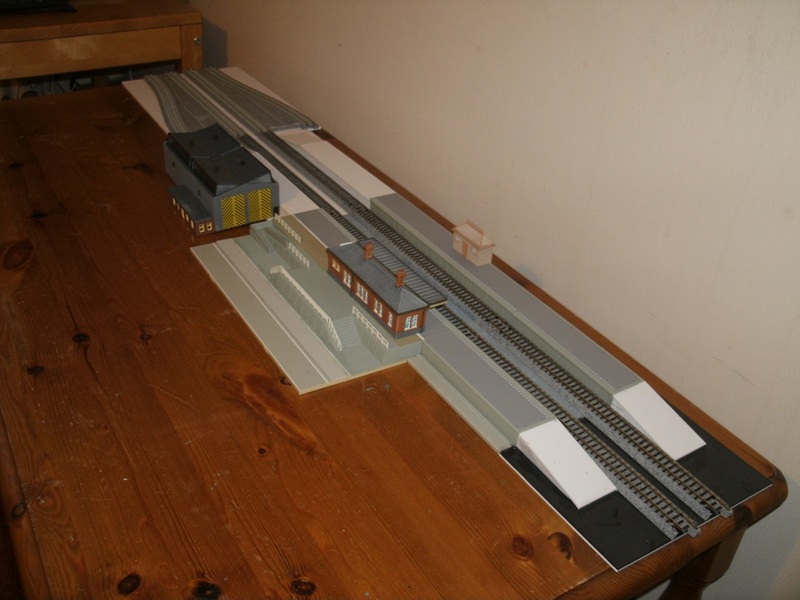 After a lot of thought I created a four-platform station, initially with two through lines and two bays. 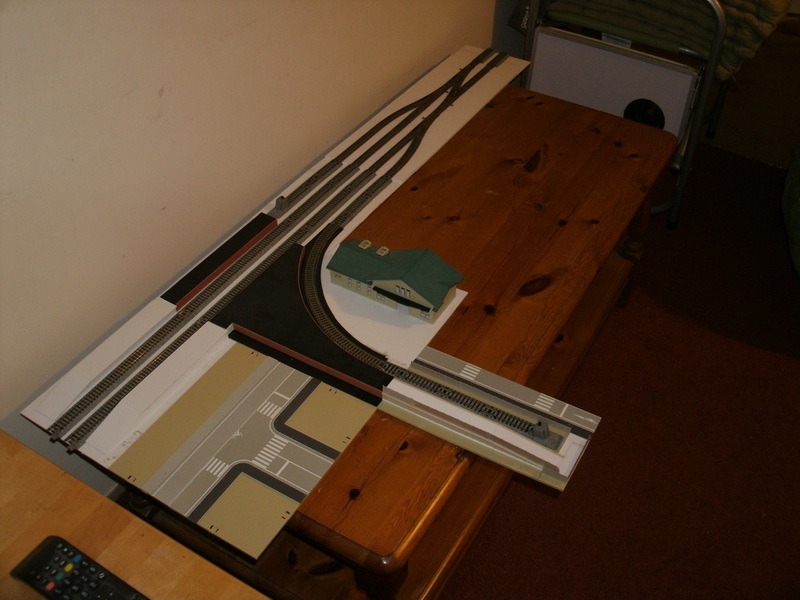 The diverging 4-track formation is made from 310 x 194 mm styrene, the 4-platform section is 434 x 194 mm. I'm waiting for the glue to set, then filling any gaps along the side walls, trimming any other excess plastic and finally fixing both platform top surfaces. 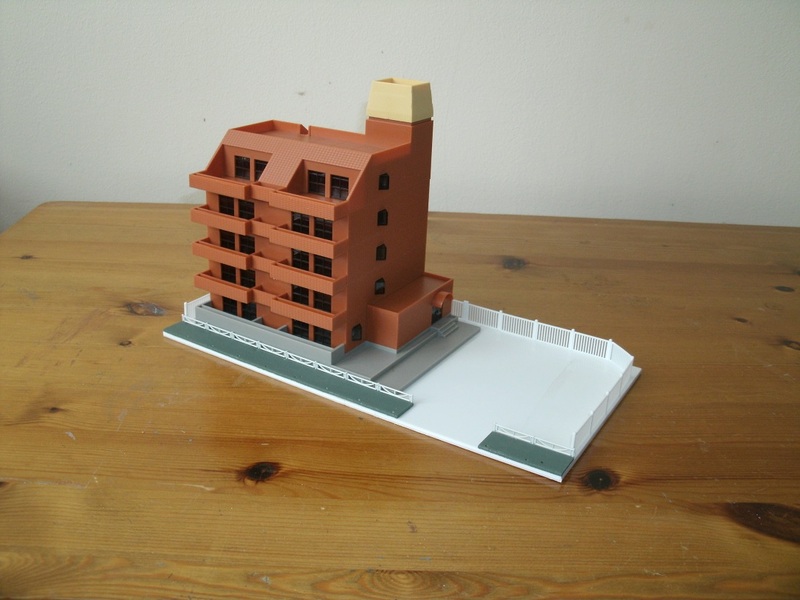 Sometimes I've left projects aside for some time and later realised that they weren't optimal. My earlier concept "Millerhurst" didn't work well on this module because the Collett & Dean engineering works factory wasn't easily accessible by rail on these boards below. A former schoolmate belonged to the Shaftesbury Harriers club in north London. I'm registered with the Shaftesbury Medical Practice and it's not far away from the long-demolished Shaftesbury pub. One Metro bus stop is locally marked as Shaftesbury Junction. Therefore I'm placing my partially completed pub to be named the Shaftesbury near the station. A church might be an odd thing to have next to a pub but I can say it's a modern building and no objections had been raised in its location. 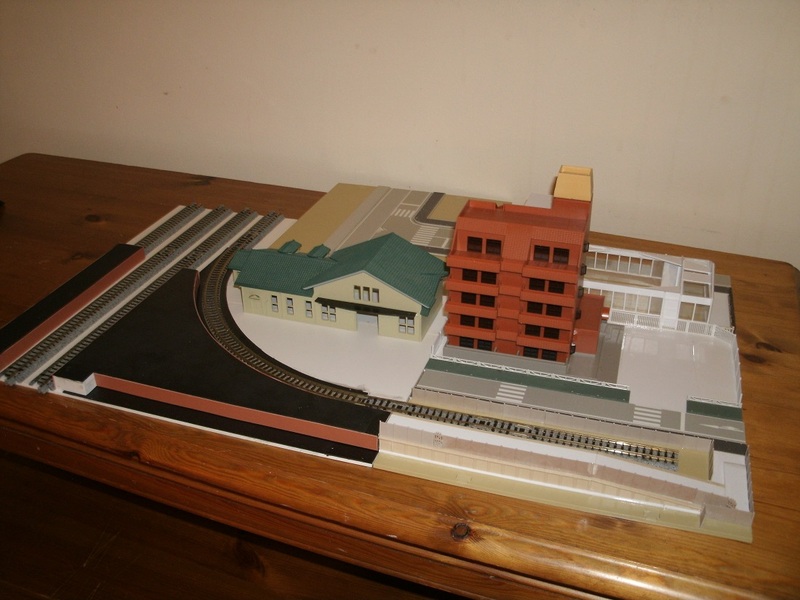 Consequently the GWR station building has been placed in store for future use and a modern platform shelter will be installed. 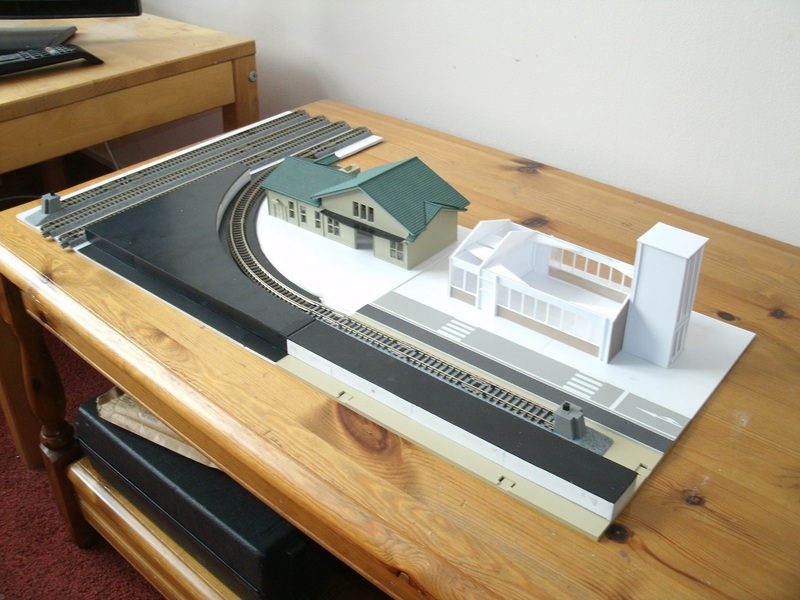 I own Scenecraft's Shillingstone station buildings but suspect that the main building would be too big to install on the curved platform. PS I unpacked Shillingstone's main station building and found it was indeed too large, even taking into account omission of canopy and building extension. 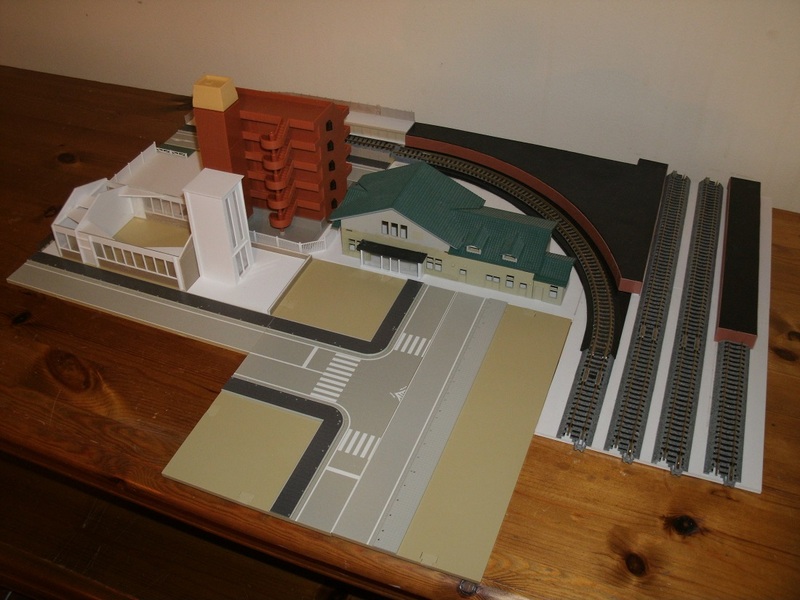 Here's my latest developments on "Shaftesbury Junction"
I found my scratchbuilt St Alban's Church just fitted on a standard Kato DioTown road section. I've always intended the cut-off point as 2008, but may extend it as late as 2015/16 if I buy a Farish FGW plain livery class 150/1 version, however I've no plans to model the GWR or South Western Railway franchises. I tracked down and ordered a model of Farish's 371-330 FGW 150/1. Some weeks ago I saw a de-branded FGW blue 150/1 in Leeds station. 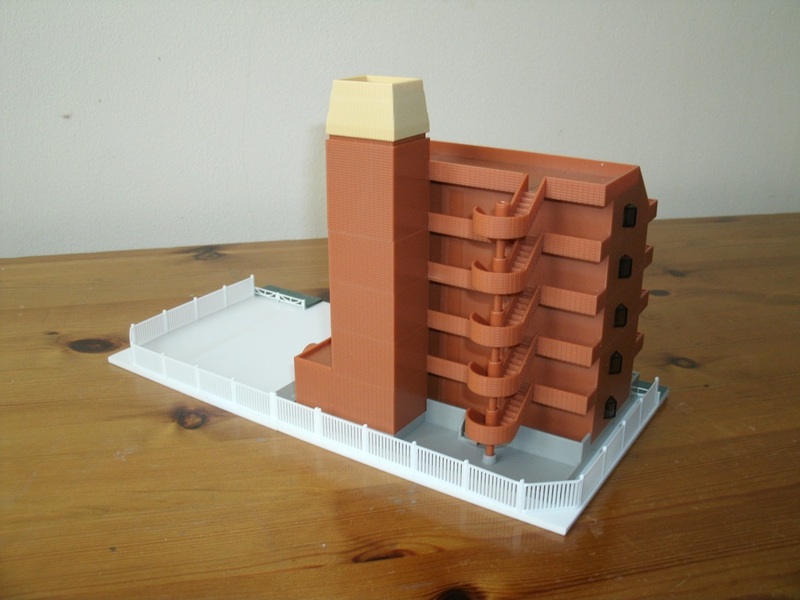 After some deliberation, I decided to set "Copthall Court" in its own compound, but not make it like a gated community. The low fencing is from Kato's DioTown range, the taller, beefier fencing is Faller HO which I had in stock. Painting and final completion won't begin until the weather becomes warmer. 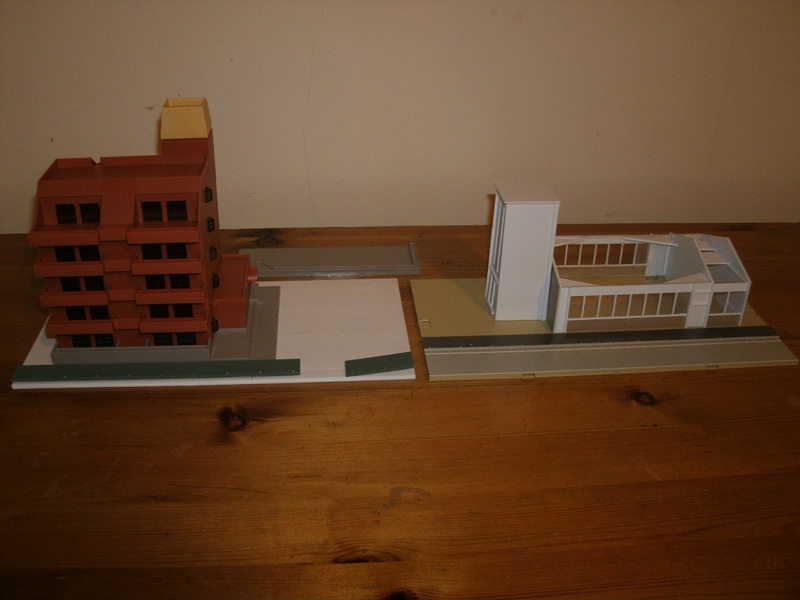 I wanted this to be as compact as possible so the block of flats and church will be placed back to back. The Shaftesbury pub will have its main entrance near the station with drop-off point and its car park and deliveries located at the rear. Kato's DioTown road sections will be remodelled for their new role. My First Great Western plain blue 150/1 has arrived! It's only just been taken out of the boxes for photography; a full running-in session will take place. 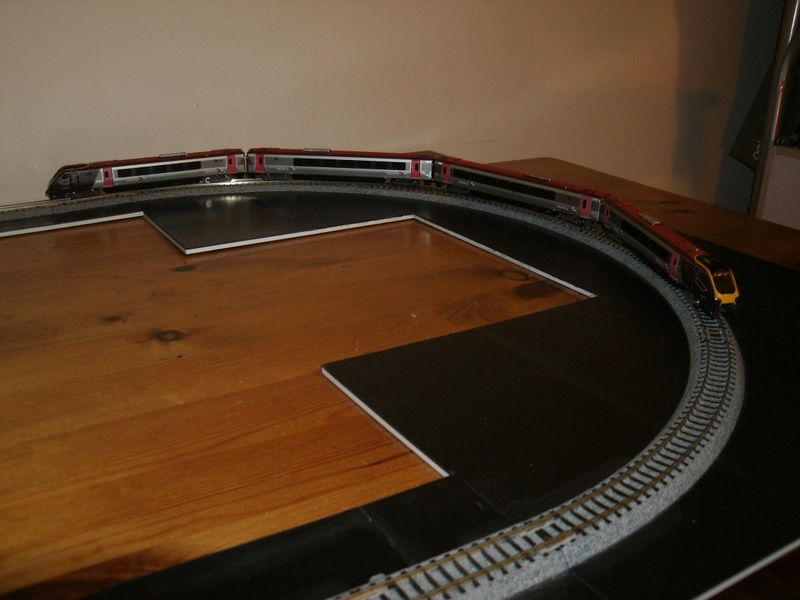 Together with my CrossCountry Voyager, this means the layout's era is extended to about 2016 instead of 2008. However, I'm not planning acquiring present day GWR liveried stock. Rather than creating custom sections, I've decided to use modules and other parts held in stock. 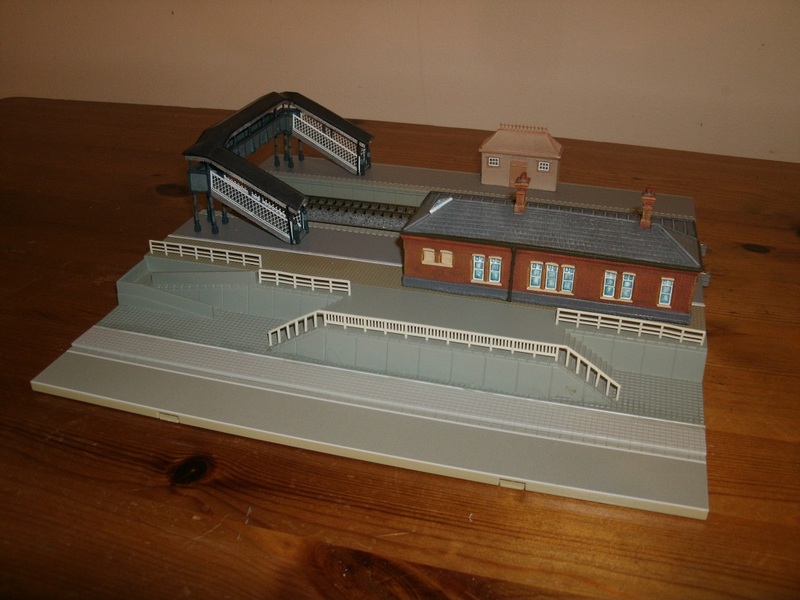 Millerhurst will have a GWR feel to it with TimeCast station building and Scenecraft pagoda shelter, but modelled in Network SouthEast days, though with retro fittings. The station is unstaffed but it's been taken over as a pub named "Isambard Kingdom Brunel" the guy whose surname I've honoured was a former schoolmate who attended Brunel University. The loco shed (Peco, with Kestrel extension) is home to "Collett & Dean Engineering" to be built on a 248 x 220 mm module with provision for rail access, I knew a teacher and ex-pupil with those surnames. 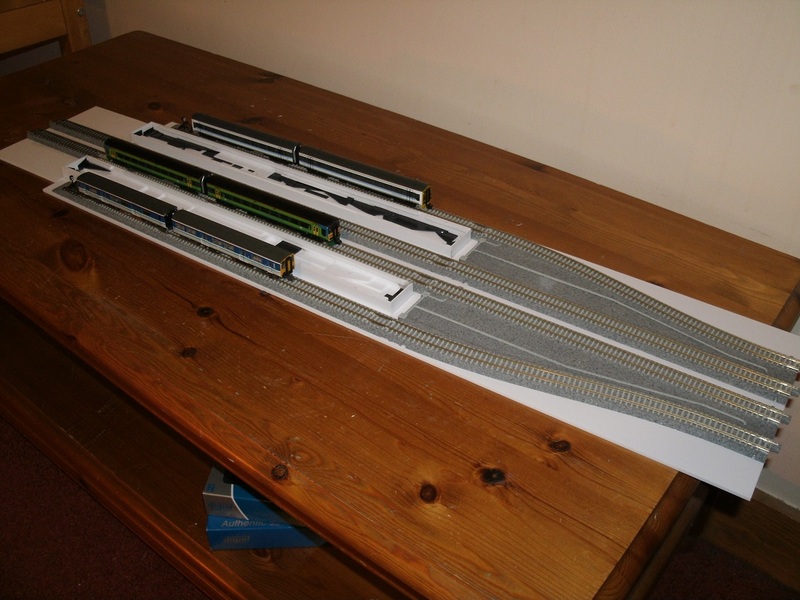 My order for Scenecraft's GWR style footbridge and spear fencing arrived today for Millerhurst station. I could have made up Ratio's footbridge kit but decided to buy a ready to plonk one instead. Tonight I collected my Farish Cross Country Voyager from Argos. It's more fiddly to couple up compared with Dapol's version but will be quicker with practice. My plans are for two pairs of CrossCountry services each running between Leeds-Southgrove and Leeds-Bournemouth timed so that it's possible to spend several hours at their terminal destinations on day trips meeting friends and relatives. Forgive me but how did you get it at Argos? I haven't seen any Voyagers for sale anywhere for ages.